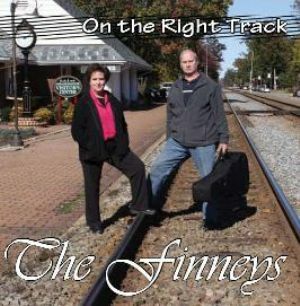 The Finneys are a Gospel Music singing duo who hail from Midlothian, Virginia. John and Frankie have been singing for the Lord ever since their marriage 24 years ago. Their music ministry has taken them up and down the East Coast, singing at all types of churches and events. Before surrendering his life and talents to Jesus over 27 years ago, John`s background was singing Country music all over Virginia. Together with Frankie`s smooth harmonies, The Finneys have a combination of sounds, ranging from Christian Country, Southern Gospel, and Gospel Bluegrass. John is an accomplished song writer. The FINNEY`S recent project "On The Right Track" has 10 songs all written by John, and they each come with a story as to how God prompted him to write them. The picture on the left is the CD cover for the project, and samples of the songs can be heard while on this page, through the player on the right. It`s ALL about JESUS! The FINNEYS have a deep passion for sharing the Gospel message through music and testimony. Their hope is that the music will encourage and minister to everyone who comes to a FINNEYS concert!